In my late elementary days, probably around 5th or 6th grade, I really used to be into fingernail polish. I had a ridiculous amount of the stuff, and I loved the bright, fun colors the best. One of my clearest and most favorite memories in the whole world involves two bottles of pastel blue and pink polish, and my Grandpa Blessing. You see, I had developed this technique in which you swirled the two colors together (a very scientific and professional method) on each nail, and came out with this goopy bubblegum blob that I swore was so cool. 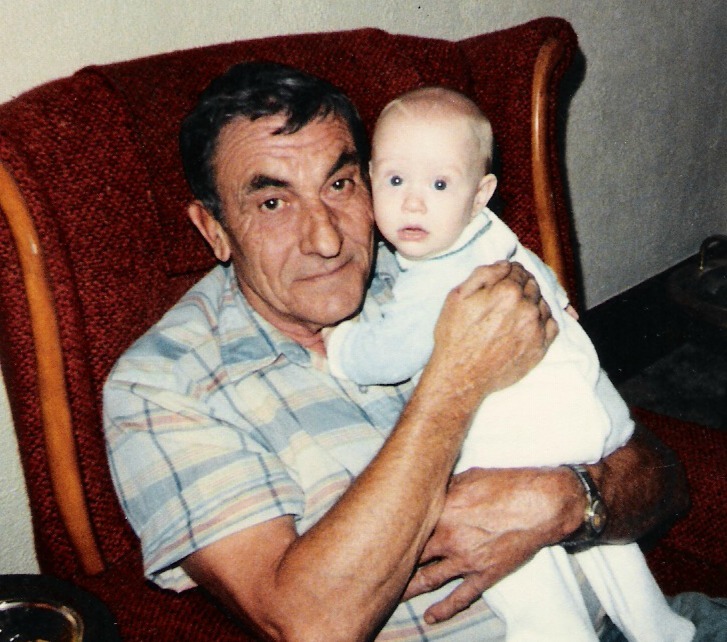 Now, I don’t remember the events that let up to this, but the scene in my head is one of my Grandpa patiently watching and chatting with me while I globbed baby pink and blue swirls all over his weathered, manly-man fingernails. I can see the wood-paneled walls of the kitchen, and I can see the pretty little glass of whiskey (bourbon? I don’t know my brown liquors very well) and cola sitting on the table next to an ashtray. Vices? Of course, but I didn’t care. I was painting my Grandpa’s fingernails. I painted and talked, and Grandpa listened and talked back to me. He sipped his drink and I sipped my Fresca and turned my head every once in a while to see if there was a squirrel perched on the corn cob feeder out in the yard. It was a nice summer day and the hot breeze was trickling in through the door screen. There was probably a football game going on in the living room that looked like a perfectly-preserved vintage time-capsule. I can promise you that there was a line of big, fat, ripe tomatoes from Grandpa’s garden lined up on the windowsill above the sink. If you wanted, I could tell you what was in all of those cupboards, and that there was most definitely a box of Neapolitan ice cream in the freezer, waiting for Grandpa to make the most amazing malts in the whole world. The cupboard on the wall between the stove and the sink housed a container of Carnation malted milk, and it was just waiting to meet its frosty destiny in the pit of my sister’s and my stomachs. It’s been a very long time since I’ve last seen my Grandpa, and I sometimes find myself quietly wishing to be painting his nails again, and to talk to him about things that are much more important than a fake fashion magazine and the fact that my parents won’t let me see the most recent Brad Pitt movie. I can’t, though. All I have are my memories, and this one is one of my favorites. Lucy shares the same birthday as Grandpa Blessing, and I think she’s inherited his twinkle . . . the warning twinkle in her eye that lets you know she’s about to give you a little hell. . . but with as much love as possible. The most good-hearted elbow-jab you can get. I don’t think she could have gotten a more perfect birthday gift from her great grandpa.